Utter | Alastair Cook Breaks Sachin Tendulkar’s Record! 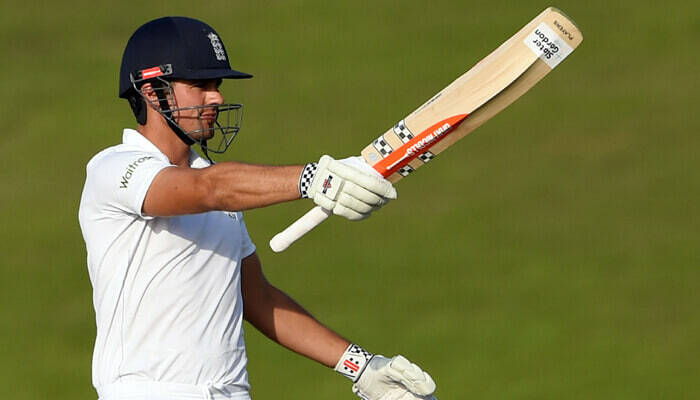 HOME / TRENDING / ALASTAIR COOK BREAKS SACHIN TENDULKAR’S RECORD! The year was 2005. The world witnessed an unbelievable feat. Sachin Tendulkar, 31 years 10 months and 20 days old, scored his 10,000th run and became the youngest batsman ever to have done so! India was proud to have housed this achievement. But not for long! On Monday, the 30th of May, Alastair Cook became the first ever England cricketer to cross the 10,000-run mark in Test cricket, and the youngest overall, beating Tendulkar’s record by five months. England captain Cook, already his country’s leading Test run-scorer, came into the ongoing second Test against Sri Lanka at Chester-le-Street just 20 runs away from becoming the first Englishman to join the coveted 10k club. In the second over of the second innings, he flicked a Nuwan Pradeep delivery to mid-wicket for four and re-wrote history. Cook is the 12th batsman to score 10,000 runs in Tests, after Tendulkar, Ricky Ponting, Jacques Kallis, Rahul Dravid, Kumar Sangakkara, Brian Lara, Shivnarine Chanderpaul, Mahela Jayawardene, Allan Border, Steve Waugh and Sunil Gavaskar. Although we Indians would have liked to boast of the Little Master’s feat for longer, we congratulate England and Cook!